(This recipe is adapted from one by Rose Elliott). 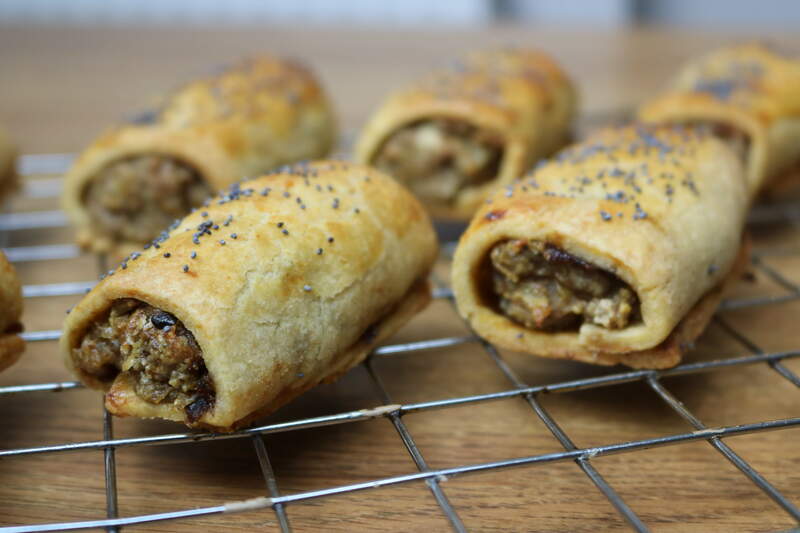 These vegetarian 'sausage' rolls are delicious and savoury, and most meat-eaters will enjoy them too. You can make a large batch and keep them refrigerated for several days, and they'll even weather the freezer if you want to tuck a batch away. Make the pastry by combining 175g wholemeal floor with 125g butter and 1 tsp baking power to make ‘breadcrumbs’. Mix in 75g grated cheese, and add water to form soft dough. Combine 125g mixed ground nuts, 50g mashed potato, one large onion chopped and fried, 1 tsp yeast extract (e.g. Marmite), 1 tsp dried sage, 1 egg, salt and pepper. Form into small ‘sausages’ and bake for 20mins at 160C. Thinly roll out pastry and brush lightly with a sweet chutney. Place slightly cooled sausages on pastry and roll up, cutting to shape. Bake finished rolls for about 10-15mins at 230C having brushed tops with milk or beaten egg and dusting with seeds of your choice.